1st Lt. Quentin Ellis, Navigator; 1st Lt. Robert Singer, Bombardier; Capt. David Bramble, Pilot; 1st Lt. Philip Mack, Co-pilot; T/Sgt. John Williams, Engineer/Top Turret Gunner. S/Sgt. Walter "Dutch" Reich, Tail Gunner; T/Sgt. Paul Zimmerman, Radio Operator; S/Sgt. Ray Ridings, Ball Turret Gunner; S/Sgt. Jerry Bernasconi, Waist Gunner; S/Sgt. Rocco Poppa, Waist Gunner. The Village Flirt Factoid - As part of the 91st Bomb Group (H), 323rd Squadron, stationed at Bassingbourn, England, the crew completed a full combat tour of 25 missions between September 1943 and March 1944 (with the exception of Sgt. Bernasconi who filled in with another crew that was shot down 8 March 1944). He survived injuries incurred on bail-out but remained a Prisoner of War until the end of WWII. 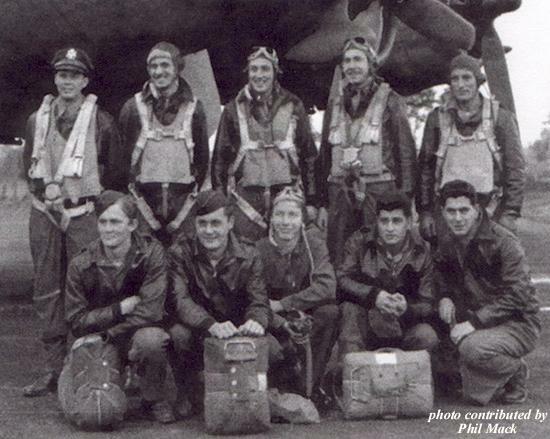 As a Lead Crew, Mack was replaced by a Group or Wing Officer on missions when the crew led the formation. He completed his last six missions as pilot-in-command, taking new crews on their first combat missions for a total of 26 missions. The crew was credited with 12 enemy aircraft destroyed, probably destroyed, and damaged.